To purchase or see upgrade options, visit buy.keyshot.com. For other questions about upgrading to KeyShot 8, email sales@luxion.com or contact your local reseller. Posted Feb 25, 2019 by Sandy McNeel on Rhino News, etc. 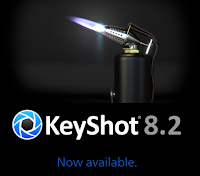 Though said to only be compatible with Rhino (v6), the plugin installation installs theKeyshot8Render, etc. commands to Rhino (v5).